My friend Anne and I went for a nice walk in the park yesterday and I couldn't help but point out all of the plants I learned about during my recent foraging class. Sassafras, lady's thumb, pokeweed, bishop's elder, hawthorne, rosehips, jewelweed, and mugwort -- we stopped to observe them all. We sampled some clover-leafed wood sorrel (see below), so bright and lemony delicious. And we happened upon a spicebush. I was so excited to be able to identify the plant by its appearance and the scent of the berry (a sweet, spicy aroma). So we collected a few berries. I'm going to dry them out and grind them up for seasoning. You can also use the leaves, twigs, and bark for tea. I later rubbed some plantain (plantago) on the mosquito bites I acquired at our friends' barbecue. It just so happens we ate purslane salad at that shindig -- they bought theirs at the market, but we could have found some in the park, to make a Brooklyn salad as they called it. I've been bitten by the foraging bug (I'm not talking mosquitos anymore). In a couple of weeks my boyfriend, some friends, and I are heading out with Wildman Steve Brill to get our hands dirty in Prospect Park. It's so great to be able to identify plants, and whether they're edible, medicinal, or neither. It just gives you a different perspective on the world around you. About a month ago I couldn't tell you what any of these things were, save clover. And I can't wait to learn more. Add about 1/4 cup of vinegar to your laundry load. Your clothes will be soft and won't smell like a salad. 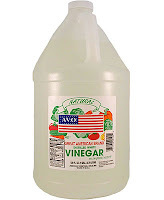 I can attest to the power of vinegar as a deodorizer -- I use it to get the stink out of my yoga mat after Bikram class. I just put the mat in a bath of water and about 1/4 cup of vinegar and presto, chango -- no stinko! Who needs Windex? Just mix 1 part vinegar with 5 parts water and spray. It works on any glass surface. Use vinegar on greasy countertops, stoves, and even walls. It naturally breaks up the nasty mess. You can also use it to clean the floors. Add about 1/4 cup to a bucket of water and clean the whole house. Wipe vinegar on the sink or bathtub to break up mineral deposits. 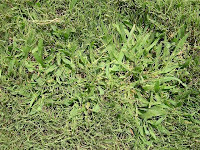 I generally think lawns are a waste of good food growing space, and I actually like crab grass and so-called weeds like dandelion (it makes a yummy salad!) and clover. But if you've got a lawn and hate the sight of invasive plants, vinegar can kill them. The regular 5% acetic you can find in the supermarket should work, but you may have to apply more than once. Be sure to apply the vinegar only to the unwanted plant, as vinegar is a non-selective herbicide (i.e., it will kill your grass if you're not careful). You can paint the vinegar on with a brush or spray it directly, avoiding the grass around it. Vinegar disturbs the pH balance of the soil, but only temporarily; it should recover in a matter of days. 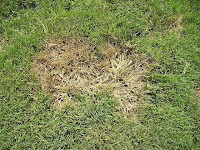 Also, be sure to apply the vinegar to dry grass on a sunny day and reapply if it rains. There are also other household ingredients you can add to make your weed killer more effective like soap and salt (read about Grandma's Weed Killer and this recipe from Thrifty Fun). Pour some vinegar on the affected area and it will kill the sting. It worked for me when I got stung in St. Lucia (something bit me real bad! ).